SOUTH BEND, Ind. (AP) — The Rev. Theodore Hesburgh transformed the University of Notre Dame into a school known almost as much for academics as for football, even if it meant challenging popes, presidents or legendary football coaches. And he did it while championing human rights around the globe, from civil rights close to home — he joined hands with Martin Luther King Jr. at a 1964 rally and opened campus doors to women — to supporting Third World development. The work often took him far from campus, where the joke became that while God was everywhere, Hesburgh was everywhere but Notre Dame. But Hesburgh, who died late Thursday at age 97, spent enough time on campus while at the helm from 1952 to 1987 to build Notre Dame into an academic power. He was featured on the cover of Time magazine a decade into his tenure for an article describing him as the most influential figure in the reshaping of Catholic education, and he was awarded 150 honorary degrees. During his tenure, student enrollment spiked and the school's endowment grew from $9 million to $350 million. The charming and personable priest found as much ease meeting with heads of state as he did with students. His aim was constant: Better people's lives. Hesburgh died late Thursday night on the school's campus in South Bend. 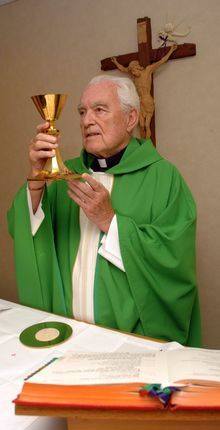 Hesburgh had lost his sight and had been slowing down, yet he still celebrated Mass daily and showed up at his campus office every day until last week, said the Rev. John Jenkins, Notre Dame's current president. "We knew when he wasn't going to the office, that was a sign," Jenkins said. In a letter Friday to the student newspaper, President Jimmy Carter recalled his 40-year friendship with Hesburgh, saying he devoted his life to serving humanity and taking courageous stands. "Father Hesburgh has made the world a better place — for those of us whose lives he has touched directly and as an inspiration for generations to come," Carter wrote. 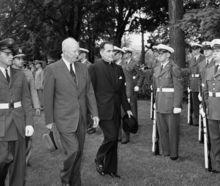 Hesburgh's goal coming out of seminary was to be a Navy chaplain during World War II, but he was sent to Catholic University of America in Washington, D.C., to pursue a doctorate. He then returned to Notre Dame, where he became head of the theology department, then executive vice president. He was named president at age 35 in 1952. His passion for civil rights earned him a spot as a founding member of the U.S. Civil Rights Commission in 1957. President Richard Nixon fired him from the commission in 1972, after Hesburgh famously challenged Nixon's record. "I said, 'I ended this job the way that I began 15 years ago — fired with enthusiasm," Hesburgh recalled in 2007. It wasn't his only challenge to authority. When the Vatican demanded conformity to church dogma, Hesburgh insisted that Notre Dame remain an intellectual center for theological debate. 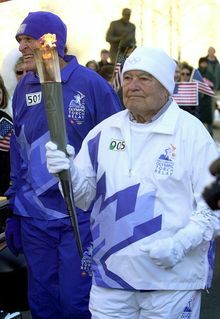 And in 1949, he took on powerful football coach Frank Leahy while reorganizing the athletic department. Hesburgh wrote several books, including the best-selling "God, Country, Notre Dame," sharing his vision of the contemporary Catholic school. In keeping with that philosophy, Notre Dame underwent profound changes under Hesburgh. Control of the school shifted in 1967 from the Congregation of the Holy Cross priests, who founded the school, to a lay board. The school ended a 40-year absence in football post-season bowl games and used the proceeds from the 1970 Cotton Bowl to fund minority scholarships. In 1972, Notre Dame admitted its first undergraduate women — which Hesburgh called one of his proudest accomplishments. "We can't run the country on men alone, never could," Hesburgh said 25 years later. "Women ought to have the same opportunities to develop their talents as men do." The school was rather undistinguished academically when he became president. It had 4,979 students, 389 faculty members and an annual operating budget of $9.7 million. When he retired, Notre Dame had 9,600 students, 950 faculty members and an operating budget of $176.6 million. It also was rated among the nation's most prestigious universities. "I'm sure I get credit for a lot of things that I'm part of but not necessarily the whole of," he once said. "We began a great university, and those who followed continued the motion forward." Despite the accolades, he drew criticism. Some objected when, after Vietnam War protesters clashed with police on campus, Hesburgh implemented a policy where students would be expelled if they didn't cease and desist within 15 minutes if disrupting the university's normal operations. Protests also met Hesburgh when he invited his former student, Jose Napoleon Duarte, to give the 1985 commencement speech. Durante's 1984 election as El Salvador's president set the country on a path to democracy after years of civil war, but protests blamed him in part for continued political killings and poverty there. Hesburgh said presenting an honorary degree to Duarte didn't mean the university had to agree with all he was doing. Hesburgh also supported the university's 2009 decision to invite President Barack Obama to speak at commencement. At least 70 bishops opposed Obama's appearance, citing Obama's support of abortion rights and embryonic stem-cell research. Hesburgh said universities were places where people of differing opinions could talk. On Friday, Jenkins recalled Hesburgh's support amid the Obama controversy. "Without talking to me, he called my mom just to say this would turn out well," Jenkins said, choking up. "They became fast friends that day. That's Father Ted. He cared about people." Through it all, Hesburgh stayed true to what he called his basic principle: "You don't make decisions because they are easy; you don't make them because they are cheap; you don't make them because they're popular; you make them because they're right." 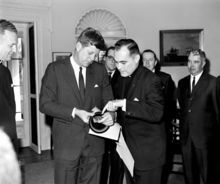 Hesburgh remained active at Notre Dame in his retirement, occasionally lecturing and presiding over residence hall Masses and helping develop the school's Kellogg Institute for International Studies and the Kroc Institute for International Peace Studies. But mostly, he was a priest and said Mass daily throughout his life. "I've said Mass in airplanes at 50,000 feet. I've said Mass in the South Pole. I've said Mass in jungles all over the world. I've said Mass in African huts. I've said Mass in cathedrals. Wherever I am, I've been able to do it for over 60 years every day and only miss a couple of times in all those years," Hesburgh once said. A public tribute will be held Wednesday evening at the Joyce Center on campus. A private, simple funeral will be held Wednesday on campus, following a wake for invited guests Tuesday evening. "Father Hesburgh often spoke of his beloved university as both a lighthouse and a crossroads — the lighthouse standing apart, shining with the wisdom of the Catholic tradition, and the crossroads joining the differences of culture, religion and conviction with friendship, civility, and love. The same can be said of the man generations of students knew simply as 'Father Ted.'" -- President Barack Obama. "Father Hesburgh has devoted his long and consequential life to serving humanity, always taking courageous stands on the serious moral issues that have faced our nation and the world from his fight for civil and human rights and against nuclear proliferation and global hunger to his ongoing efforts to seek peace among people in conflict. .... Father Hesburgh has made the world a better place — for those of us whose lives he has touched directly and as an inspiration for generations to come." -- Former President Jimmy Carter, who said he had been friends with Hesburgh for 40 years. "This is a day of both personal sadness and celebration of a singular life. I will sorely miss Father Ted, my friend and mentor of 40 years. His commitment to education and social justice was infectious and I am grateful for having experienced his common touch, his sense of humor, his love of learning and his passion for Notre Dame. When my father died, Father Hesburgh wrote to me that my dad was now 'resting in the loving hands of our savior, bathed in the light of eternal life.' Now too, does our beloved friend." -- Former Secretary of State Condoleezza Rice, who earned a master's degree in government and international studies from Notre Dame in 1975, and was a Notre Dame board of trustees member from 1994 to 2001. "He counseled presidents and popes. But he was first and foremost a priest, one who ministered to the homeless, the poor and those in need. That is when he also was happiest. We were so lucky to have him touch our lives. And those of us in Indiana were fortunate enough to experience him as our friend and neighbor." -- U.S. Sen. Joe Donnelly, D-Indiana, who was a student at Notre Dame in the 1970s. "With his leadership, charisma and vision, he turned a relatively small Catholic college known for football into one of the nation's great institutions for higher learning." "For me personally, Father Ted was a brother in Holy Cross, a mentor, a friend and a model of what a priest should be. I think of his example every day I serve as Notre Dame's president. Although saddened by his death, I take consolation in knowing he is now in the company of heaven praying for all of us." -- The Rev. John Jenkins, Notre Dame's current president. "The Book of Proverbs tells us that 'as iron sharpens iron, so one person sharpens another.' Father Hesburgh enriched innumerable lives with his visionary leadership and faithful service." -- U.S. Sen. Dan Coats, R-Indiana. "Indiana has lost a man of unwavering faith, profound vision and monumental virtue in the passing of Father Theodore Hesburgh. ... Father Hesburgh's accomplished life epitomized servant leadership and made a critical impact in advancing and bettering our world. His legacy will endure always and, without doubt, will continue to inspire individuals across the world to pursue a life of peace and justice." -- Indiana Republican Gov. Mike Pence. "Father Hesburgh understood that a university is first and foremost an institution of higher education, and he coupled that understanding with a deep appreciation of the role of coaches as perhaps the most impactful educators on a college campus. He became an ardent proponent of the rules that guide our sport because of the educational benefits that it has on the players who have the opportunity to participate at the college level. We are forever in his debt." -- National Football Foundation President Steve Hatchell. you can apply the same step of 6c2a0 steps for GRE test preparation.You can find a dlaiteed 20 Step GRE Study Plan. Filed Under: GMAT Tagged With: GMAT Test Prep Comments Policy: Use a valid email address. Have you seen any shows if so, which? i have been in christmas carol,buddy holly,misoltoe wine,and i am Annie in AnnieWhat did you think? i think annie was amnziag and friday the dog was amnziag and the locket that everyone gave is the best and the after show party was reeeeeeeeeeealy fun!!!!!! [ Sing]Any other comments? i loved playing Annie!!!!! Have you seen any shows if so, which? Cast MemberWhat did you think? i'd just like to say thanx 2 every one for being so pukka! I love everyone in pukka cos we're all like one big fialmy and we just hav a laugh! I always feel really down when we finish a production and i neva get that with other companies Ne way see u all at our mzn rave on fri! I promise not to get as bad a saturday! p.s. sorry 2 everyone who had 2 put up with me on sat! This post is a breath of fresh air. It is eznngieirg and rejuvenating. We have SO so very much to be thankful for and we're lucky--even if the toilet is clogged and is going to cost a thousand dollars to fix or your annoying in-laws are staying for a week. God is good.